Background Between-match recovery time, and acute and chronic workloads likely affect subsequent match-injury risk in elite rugby league players. Methods Workloads of 28 players throughout two seasons were calculated during short (<7 days), and long (≥7 days) between-match recovery times. ‘Acute’ workloads (1 week) greater than ‘chronic’ workloads (4-week rolling average acute workload) resulted in acute:chronic workload ratios above 1. Results No difference was found between the match-injury risk of short and long between-match recovery periods (7.5±2.5% vs 6.8±2.5%). When players had a short recovery between matches, high chronic workloads (18.9–22.0 km) were associated with a smaller risk of match injury than chronic workloads <18.9 km (relative risk (RR) range 0.27–0.32 (CI 0.08 to 0.92); likelihood range 90–95%, likely). Players who had shorter recovery and acute:chronic workload ratios ≥1.6, were 3.4–5.8 times likely to sustain a match injury than players with lower acute:chronic workload ratios (RR range 3.41–5.80 (CI 1.17 to 19.2); likelihood range 96–99%, very likely). Acute:chronic workload ratios between 1.2 and 1.6 during short between-match recovery times demonstrated a greater risk of match injury than ratios between 1.0 and 1.2 (RR=2.88 (CI 0.97 to 8.55); likelihood=92%, likely). Conclusions Contrary to the philosophy that high workloads and shorter recovery equate to increased injury risk, our data suggest that high and very-high chronic workloads may protect against match injury following shorter between-match recovery periods. Acute:chronic workload ratios ∼1.5 are associated with a greater risk of match injury than lower acute:chonic workload ratios. Importantly, workloads can be manipulated to decrease the match-injury risk associated with shorter recovery time between matches. The equivocal evidence in relation to shorter between-match recovery times and increased injury risk may be due to the fact that previous studies have not investigated player workloads between matches.4 ,5 ,8 ,9 Higher workloads can occur during longer between-match recovery times10 and higher workloads1 ,3 or abrupt increases in workloads2 ,3 ,11 can increase injury risk. However, no study has investigated the combined influence of workloads and between-match recovery time on the risk of subsequent match injury in elite team sport athletes. The effect of: (1) higher chronic workloads or (2) abrupt increases in acute workload, on the risk of sustaining a match injury following different between-match recovery times is currently unknown. Therefore, we modelled acute and chronic workloads with the risk of sustaining a match injury following short (5 and 6 days) and long (7, 8 and 9 days) between-match recovery times in elite rugby league players. Twenty-eight players (mean±SD; age, 24.8±3.4 years; height, 184.5±4.9 cm; body mass, 99.5±8.0 kg) from one elite rugby league club participated in this study over two Australian National Rugby League (NRL) seasons. This study was conducted over the competition phase of each season (2×27 weeks). Only players participating in first-team matches and completing workloads between those matches were included in the analysis. Players received a clear explanation of the study and written consent was obtained. Experimental procedures were approved by the Institutional Review Board for Human Investigation. Injury records were updated and maintained by the club's senior physiotherapist. An injury was defined as any time-loss injury that resulted in a player being unable to complete full training, or missing match time.11 ,13 ,14 Only injuries that were sustained in a match or reported subsequent to a match, prior to the next training session, were included in the combined analysis of workload and between-match recovery time. Workload data for short, and long between-match recovery times were further categorised into very-low through very-high categories according to percentile rank. These categories are displayed in table 1. Injury–workload relationships were calculated among very-low through very-high between-match workloads, chronic workloads and acute:chronic workload ratios. Match-injury risks were calculated as the total number of match injuries sustained relative to the total number of exposures to each workload classification.2 ,11 ,23 Null hypothesis testing was conducted using a binary logistic regression model with injury/no injury as the dependent variable. Between-match workloads, chronic workloads and acute:chronic workload ratios were independently modelled as predictor variables. Relative risk (RR) and 90% CI (lower-upper) were calculated to determine which workload variables increased or decreased the risk of match injury.23 A RR of greater or less than 1 implied an increased or decreased risk of injury, respectively. The influence of between-player heterogeneity on the number of injuries sustained was examined used a Poisson regression model. In this model, positional group (forwards=1, backs=2) was used as a factor, while age, body mass and height were used as covariates. There were 44 match, and 9 training injuries. No difference was found between the risk of match injury following short (injury risk=7.7±2.5%) and long (injury risk=6.8±2.5%) between-match recovery periods (figure 1). However, 8 of the 9 training injuries occurred when recovery time was <7 days (short). Risk of match injury±90% CI subsequent to short (5 and 6 days) or long (7, 8 and 9 days) recovery time between matches. The Poisson regression model did not demonstrate any relationship among the number of injuries sustained and positional group (p=0.303), age (p=0.325), height (p=0.221) or body mass (p=0.167). Figure 2A depicts the risk of match injury with very-low through very-high between-match workloads during short, and long between-match recovery times. During short between-match recovery times, a high between-match workload (17.9–21.5 km) was associated with a risk of match-injury that was: (1) 87% smaller than low between-match workloads (RR=0.13 (CI 0.02 to 0.67); likelihood=97%, very likely), (2) 82% lower than moderate-low between-match workloads (RR=0.18 (CI 0.03 to 0.95); likelihood=94%, likely), and (3) 85% lower than very-high between-match workloads (RR=0.15 (CI 0.02 to 1.03); likelihood=94%, likely). Risk of match injury±90% CI subsequent to short (5 and 6 days) or long (7, 8 and 9 days) recovery time between matches combined with between-match workloads (A), chronic workloads (B) and acute:chronic workload ratios (C). (a)Likely (≥75%) different from moderate-high between-match workload and very likely (≥95%) different from high between-match workload, during short between-match recovery times. (b)Likely (≥75%) different from high between-match workload during short between-match recovery time. (c)Likely (≥75%) different from high chronic workload during short between-match recovery time. (d)Likely (≥75%) different from low, and moderate-high acute:chronic workload ratios during short between-match recovery time and high acute:chronic workload ratio during long between-match recovery time. (e)Very likely (≥95%) different from low, and moderate-high acute:chronic workload ratio during either between-match recovery time, and high acute:chronic workload ratio during long between-match recovery time. Likely (≥75%) different from moderate-low acute:chronic workload ratio during either between-match recovery time and very-low and high acute:chronic workload ratio during short between match recovery time. (f)Likely (≥75%) different from low, and moderate-high acute:chronic workload ratio during either between-match recovery time. Likely (≥75%) different from high acute:chronic workload ratio during long between-match recovery time. No match injuries were sustained when players (n=17) had a very-high chronic workload (≥22.1 km) during short between-match recovery times. A high chronic workload (18.9–22.1 km) was associated with a risk of match injury that was: (1) 73% lower than a moderate-low chronic workload (RR=0.27 (CI 0.08 to 0.92); likelihood=95%, very likely), and (2) 68% lower than a low chronic workload (RR=0.32 (CI 0.08 to 1.22); likelihood=90%, likely; figure 2B). During short between-match recovery times, there was a linear trend for lower risk of subsequent match injury as chronic workload increased (figure 2B). A high acute:chronic workload ratio (1.23–1.61) during short between-match recovery times demonstrated a risk of match injury that was 2.88 times greater than a moderate-high acute:chronic workload ratio combined with short recovery between matches (RR=2.88 (CI 0.97 to 8.55); likelihood=92%, likely; figure 2C). The risk of match injury with a very-high acute:chronic workload ratio (≥1.62) combined with short recovery between matches was: (1) 5.80 times greater than a moderate-high acute:chronic workload ratio (RR=5.80 (CI 1.75 to 19.2); likelihood=99%, very likely), and (2) 3.41 times greater than a low acute:chronic workload ratio (RR=3.41 (CI 1.17 to 9.91); likelihood=96%, very likely; figure 2C). Long between match recovery times, combined with a very-high acute:chronic workload ratio (≥1.50) displayed a risk of match injury that was 4.46 times greater than a moderate-high acute:chronic workload ratio (RR=4.46 (CI 0.91 to 21.91); likelihood=92%, likely; figure 2C). With the exception of high acute:chronic workload ratios, when players’ acute:chronic workload ratios were taken into account, the recovery time between matches did not have a significant independent effect on injury risk in the subsequent match (figure 2C). This study investigated the combined influence of recovery time between matches and player workloads on subsequent match-injury risk in elite rugby league. We found no difference in the risk of match injury, subsequent to short (7.7% injury risk) or long (6.8% injury risk) recovery between matches. Our findings demonstrate that higher chronic workloads can reduce match injury risk following short between-match recovery times. However, increases in acute:chronic workload ratios are associated with a higher risk of match injury following short and long between-match recovery times. The influence of workload and workload ratios on injury risk: does congestion matter? We demonstrated that a controllable factor (workload) is associated with higher match-injury risk than non-modifiable between-match recovery time in isolation. Specifically, during short between-match recovery times, chronic workloads were associated with a linear trend for lower risk of injury as chronic workload increased. Additionally, high (1.2–1.6) and very-high (>1.6) acute:chronic workload ratios combined with a short recovery between matches were associated with a risk of match injury that was 2.8 and 5.8 times higher than an acute:chronic workload ratio between 1.0 and 1.2. Furthermore, with a long recovery between matches, very-high acute:chronic workload ratios (≥1.5) displayed a fourfold increase in match injury risk compared with ratios of 1.1–1.2. These findings demonstrate that higher workloads prior to short between-match recovery times can decrease injury risk, while sudden upgrades in workload will increase match-injury risk, regardless of the recovery time provided between matches. Previous studies may support our findings that a high chronic workload can reduce the risk of match injury. Specifically, Gabbett et al demonstrated that rugby league players with greater aerobic capacity,30 and prolonged high-intensity running ability31 have a lower risk of injury. Furthermore, only 2 weeks of low-volume sprint interval training is required to elicit improvements in the high-intensity, intermittent running ability and aerobic capacity of team sport athletes.32 Therefore, considering that rugby league training and match play involves sprinting efforts interspersed with low-intensity activity,33 ,34 the athletes in the current study that achieved a higher chronic workload may have improved or maintained these physical qualities and in turn decreased their risk of sustaining a match injury when provided a short recovery between matches. However, for chronic workloads to be increased and provide resistance to injury, an acute:chronic workload ratio greater than 1 must be cautiously prescribed at strategic periods throughout the season. The findings of the present study suggest that the associated injury risk would be lower if workloads were increased during between-match recovery times of 7 or more days, with an acute:chronic workload ratio between 1 and 1.5. Valid analysis of injury risk in relation to collisions, high-speed running and accelerations is not possible with the GPS equipment used in this study.15–19 Injury risk in team sport athletes can also be attributed to multiple factors that have not been included in this study.23 ,27 However, to achieve the statistical power required to investigate other factors such as previous injury, age and physical fitness, in conjunction with the modifiable and non-modifiable injury risk factors in the present study, would require a considerably larger data set comprising many teams over a number of seasons.23 Of course that brings with it the confound of different training regimens (an inherent limitation of ‘ecological’ research). Our data demonstrated that when short and long between-match recovery times are viewed in isolation, no difference in injury risk occurred. This study suggests that low chronic workloads, and the acute:chronic workload ratio are more predictive of injury than merely the recovery time provided between matches. Specifically, a higher chronic workload provides protection against a spike in acute workload, which was associated with the greatest risk of match injury in this study. Furthermore, provided that very-high acute:chronic workload ratios (∼1.5) are avoided, higher between-match workloads can be achieved without increasing injury risk in elite rugby league players. This study offers practitioners fresh insight of how a controllable factor (workload) can be modified to decrease match-injury risk during elite rugby league competition. 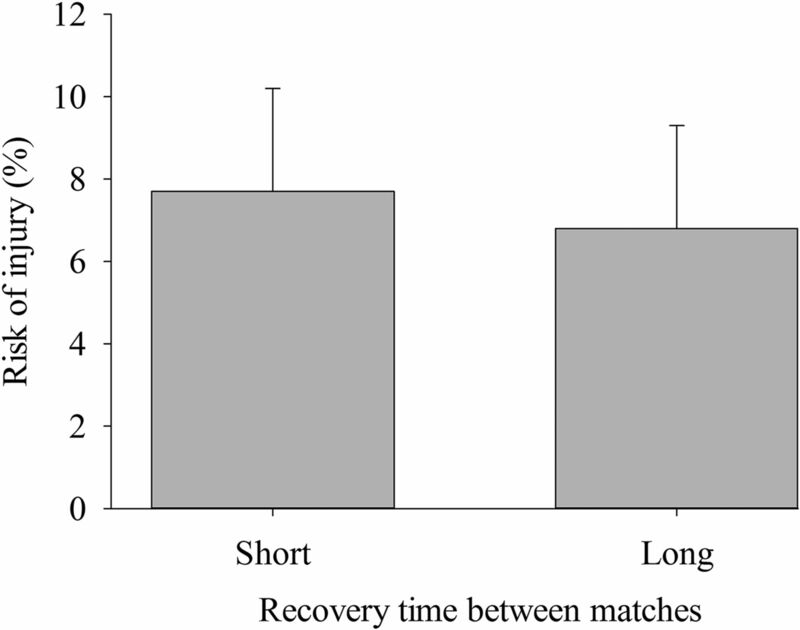 Without taking other factors into account, the match-injury risk following ‘short’ between-match recovery times (5 or 6 days) was 7.7%; this was no different to the match-injury risk of 6.8% following ‘long’ between-match recovery times (≥7 days). Higher workloads prior to short between-match recovery times may decrease injury risk, while sudden upgrades in workload will likely increase match-injury risk, regardless of the recovery time provided between matches. This study adds to the body of literature suggesting that the acute:chronic workload ratio should be considered when evaluating workload-related injury risk in various sports. Using these findings to plan training across a season, taking into account between-match recovery times, may decrease injury risk. The positive and negative influences of workload on injury risk may be useful for strength and conditioning coaches and clinicians involved in planning training programmes in elite rugby league.
. Neuromuscular and endocrine responses of elite players to an Australian rules football match. Int J Sports Physiol Perform 2008;3:359–74.
. The acute:chronic workload ratio predicts injury: high chronic workload may decrease injury risk in elite rugby league players. Br J Sports Med 2016;50:231–6.
. Accuracy of GPS devices for measuring high-intensity running in field-based team sports. Int J Sports Med 2015;36:49–53.
. The training-injury prevention paradox: should athletes be training smarter and harder? Br J Sports Med 2016;50:273–80.
. High training workloads alone do not cause sports injuries: how you get there is the real issue. Br J Sports Med 2016;50:444–5.
. A spreadsheet for deriving a confidence interval, mechanistic inference and clinical inference from a P value. Sportscience 2007;11:16–20. Contributors BTH, TJG and JAS are responsible for the concept and design of this project. Injury and workload data were collected by DL and BTH, respectively. BTH was responsible for data analysis. PC revised this manuscript and provided statistical expertise. Funding Technical or equipment support for this study was not provided by any outside companies, manufacturers or organisations. BTH was funded by a postgraduate research scholarship supported by the University of Wollongong and the St. George Illawarra Dragons Rugby League Football Club. Ethics approval UOW and ISLHD Health and Medical Human Research Ethics Committee.